South Africa Gets Closer to U.S.
Western Sahara - Will Obama and Zuma Agree to Disagree? 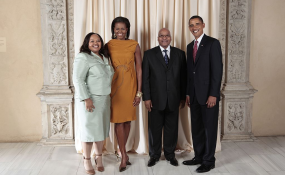 The presidents and first ladies of the U.S. and South Africa. We’ll be flying there on Wednesday, arriving Wednesday night in Senegal time. It was important for us, we felt, to travel to West, South and East Africa. So we’re beginning in West Africa, in Senegal, which is a strong democratic partner of the United States. We recently hosted the President of Senegal [President Macky Sall] at the White House -- a French-speaking country, which allows us to speak directly to the large French-speaking population within Africa. The President will begin his program on Thursday with a bilateral meeting with the President of Senegal. Following that, we’ll have a joint press conference. Then, the President will attend an event that he’ll be hosting at the Supreme Court there with regional judicial leaders. And this will be an opportunity for the President to speak to the importance of the rule of law and the role of the independent judiciary as a part of African democratic institution-building. So the President will have a chance to have a dialogue with judicial leaders from the region. Then he and the First Lady will take the trip to Goree Island, obviously a deeply important site both for Africans and African Americans. This is the site of the “Door of No Return,” and the President will be visiting the House of Slaves museum there on Goree Island. Then he will also visit with civil society leaders at the Goree Institute. Goree Island has been a home for a very vibrant civil society, which is also a key part of the democratic development taking place in Senegal and across the continent, and so he’ll have a chance to hear directly from civil society leaders there. Then, that night, there will be an official dinner that the President of Senegal will be hosting. The First Lady [Michelle Obama] on June 27th in Dakar, will have tea with the First Lady of Senegal [Marième Faye Sall]. Then the First Lady will travel with Mrs. Sall to the Martin Luther King Middle School, which is an all-girls school in Senegal, where she’ll have a chance to see that school and speak to the girls. And then, of course, the First Lady will join the President at Goree Island and for the dinner that night. The second day, the President will begin in the morning by joining an event focused on food security. Food security has been one of our key development priorities, in which we’ve brought together the international community as well as the private sector behind approaches that strengthen African capacity in developing agricultural sectors that better feed the populations and also allow products to get to market -- allows Africa to forge solutions to the challenges of feeding their population. And so the President will join an event that brings together private sector leaders and people from the agricultural sector in Senegal and across West Africa, and he will hear about the efforts that are being made to enhance food security and be able to join with them where there will be different expositions of technologies that are being applied to improve crops, improve the ability of agricultural sectors to meet the needs of the people. Then the President will fly with his family to South Africa that day. The next day, the President will be in Pretoria and Johannesburg. And he’ll begin the day with a bilateral meeting with President Zuma of South Africa, clearly a key partner on a whole range of our issues on the African continent to include some of our significant development priorities but also a range of peace and security issues, from our efforts to deal with the situation in Sudan and South Sudan to some of the security challenges in Central Africa, and of course, to the promotion of democracy on the continent. There will be a bilateral meeting and then the two Presidents will have a joint press conference. Then later that day, the President will host a town hall at the University of Johannesburg in Soweto. This is going to be a continuation of the President’s Young African Leaders Initiative. You may recall that the President launched this initiative when he hosted African leaders from across the continent at his town hall meeting at the White House, with the idea being that we need to reach the next generation of African leaders in civil society, in entrepreneurship, in journalism. And the State Department carried forward a program that connects African leaders across the continent to one another and to the United States. And it’s been one of the more exciting initiatives that we've had in terms of people-to-people programs. And this will carry that initiative forward. And so he'll be speaking to young African leaders about the U.S.
investment in deepening ties with young people not just in South Africa but across the continent. Following the town hall meeting, the President will have a bilateral meeting with the Chairwoman of the African Union [Dr. Nkosazana Dlamini Zuma], again focused on strengthening mutual organizations across Africa, with the African Union, of course, being the most prominent one on the continent. And so they’ll have the opportunity to discuss the agenda in the United States with the AU. Then that night there will be an official dinner that President Zuma will host for President Obama. I'll also add that the First Lady on this day -- she will have tea with the wife of the South African President, Mrs. Thobeka Madiba-Zuma. Later in the afternoon, the First Lady will also hold remarks and participate in a discussion with youth, and this will be an opportunity for her to meet with high-school-age young people in South Africa. I'd add that the First Lady in her last trip to South Africa met with young people. And this continues her focus on education, youth, and women and girls around the world. This event that the First Lady is participating in develops a theme organized in conjunction with MTV Base, which is an African youth and music television channel... The First Lady will be joined at the Sci Bono Discovery Center by teenagers from across South Africa, as well as students who will be able to join virtually from cities across the United States via Google+ Hangout, including in Los Angeles, California, Kansas City, Missouri, New York City, and Houston, Texas. And so this is an opportunity to connect young people in the United States with young people in Africa to discuss our shared future. We'll also be covering this live not just on White House.gov, but on our Google+ page and MTV Base. And then that night, the First Lady will join the President for the official dinner. The next day, the First Family will fly to Cape Town in the morning. They will visit Robben Island and have the opportunity to take in the remarkable history there and pay tribute to the extraordinary sacrifices made by Nelson Mandela in his pursuit of freedom for the people of South Africa as well as so many other figures in the anti-apartheid movement. Following the visit to Robben Island, the President will visit a community center with Archbishop Desmond Tutu -- a community center that focuses in part on health, and this will be an opportunity for the President to hear first hand about the important efforts that are being made by the Archbishop, but also by people across South Africa that come up with community-oriented solutions to health care challenges, but also to discuss our own global health agenda, much of which has been focused on combating preventable diseases, HIV/AIDS, and carrying forward the very good work that's been done for many years to improve not just -- combat disease, but to improve public health systems in South Africa and across the continent. Following the visit to the community center the President will give a speech at the University of Cape Town, which will be his main framing speech of the trip about our Africa policy, focusing on these different areas of trade and investment, development, democracy, partnerships on behalf of peace and security. The University of Cape Town is an historic site -- one of the great universities on the continent; a place that has been host to very significant speeches, including the speeches Robert F. Kennedy gave — the Day of Affirmation address where he spoke about "ripples of hope." And so the President will be able to lay out a vision for U.S.-African relations going forward. Then that would conclude the program in Cape Town. The next day, the President will fly with the First Family to Tanzania, also a strong democratic partner of ours in East Africa. He'll have a bilateral meeting there with the President [Jakaya Kikwete] and then they will host a joint press conference. Following the joint press conference, the President will go to a roundtable with business leaders. And then he'll speak to a group of business leaders and CEOs from the United States and across Africa. And this will be an opportunity for him to really focus on what we can do to increase trade and investment from the United States into Africa, what we can do to advance our trade relationships, dealing with AGOA and other opportunities that we have going forward, how do we improve the climate for economic growth in East Africa and Africa generally. I should add that in addition to this event and the food security event with the private sector in Senegal, members of the President's economic team - Valerie Jarrett, Mike Froman, Fred Hochberg, and Raj Shah - will be participating in an event with the private sector in Cape Town as well, independent of the President. And they'll be discussing these issues there as well. So the President will speak to business leaders and CEOs about these issues. And then, that night he'll attend an official dinner hosted by the President of Tanzania. For the First Lady, that day she'll have tea with Ms. [Salma] Kikwete, the wife of the Tanzanian President. And then, she will visit the memorial to the embassy bombing at our embassy. Then the First Lady will attend a performance by the Baba wa Watoto troupe, which serves underprivileged boys and girls between the ages of 5 and 18 years old. And then she will join the President for the dinner that night. Then, finally, on our last day of the trip, the President will begin his day by going to the embassy and also laying a wreath at the sight of the memorial to the embassy bombings. Then, he will visit the Ubungo power plant in Tanzania -- one of his focuses of not just our development policy, but also our support of economic growth on the continent is power, and the President will be able to speak to those issues as he visits the Ubungo power plant. And then that will conclude the President's agenda on the trip. I'll also add on July 2nd, the last day, in Dar es Salaam, the First Lady will participate in an African First Ladies' Summit, Investing in Women Strengthening Africa, which is going to be hosted by the George W.
Bush Institute, including Laura Bush. At the summit, first ladies from across the continent will gather to focus on the important role that first ladies play in promoting women's education, health and economic empowerment. I think that this will also speak to the bipartisan support that exists in the United States for support for sub-Saharan Africa, for deeper relations between the United States in sub-Saharan African countries, and of course, for the empowerment of women and girls in sub-Saharan Africa and around the world. What Does Obama's Visit Bring to Africa? Copyright © 2013 allAfrica.com. All rights reserved. Distributed by AllAfrica Global Media (allAfrica.com). To contact the copyright holder directly for corrections — or for permission to republish or make other authorized use of this material, click here.